The Chevrolet Colorado ZR2 is GM’s first attempt in over a decade to create a performance-oriented pickup truck that can tackle all types of road surfaces and conditions. If you like the idea of having a trail-ready pickup truck but don’t want to tinker first with a stock truck, the Colorado ZR2 was designed to be your compromise. It certainly looks the part: The revised front fascia sports a protruding aluminum skid plate. For added visual effect, there’s a non-functional hood scoop. But how does it drive? We traveled to Gateway, Colorado, just east of the Utah-Colorado border, to give the Colorado ZR2 a rugged test. 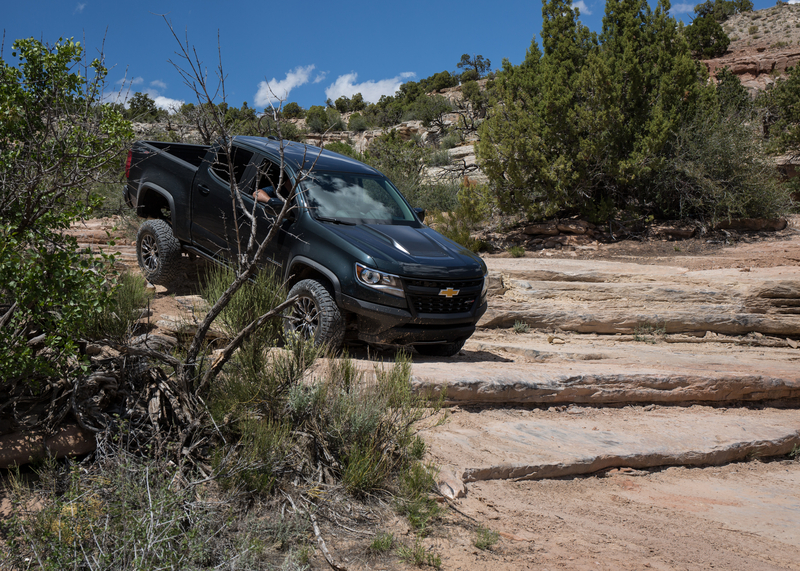 The first thing you’ll notice is how smoothly the Colorado ZR2 operates, whether on a dirt track or the freeway. Refinement and finesse distinguish the Colorado ZR2 from the moment you set out. It’s proficient in rock-crawling and light desert-running, thanks to two electronic locking differentials, hill-descent control with variable speed settings, selectable four-wheel drive, and knobby tires. The deal is sweetened by dampers developed by Canadian engineering and production company Multimatic, which are intended to smooth out the bucking that usually comes with a day of off-roading, and keep the body stable while the wheels rise and lower over varying surfaces. We first turned on the off-road mode on a Baja-style dirt course set in a valley between the buttes then started slinging the truck sideways around the dirt course’s tight corners — finding minimal intrusion from vehicle stability control. With the traction control off and 4WD High engaged, it’s one step from a homologated rally truck. The course was littered with tabletop-style jumps, and no matter how many wheels we had off the ground at once, the landing was a fall, not a crash. The trick to keeping the 2.8-liter diesel Colorado ZR2 moving on the track was left-foot braking ahead of turns; otherwise, there was some lag in getting back up to speed. Speaking of paved roads, there was an unexpected surprise on the return drive to Gateway: The Colorado ZR2 is actually even more comfortable to drive on-road than an average Colorado. Credit goes, again, to the supernaturally adept dampers, for turning an otherwise wiggly pickup truck fitted with 31-inch mudding tires into a decent highway cruiser. Steering is sharp and on point, and power from either engine is plentiful. What the Multimatic magic can’t solve, however, is the Colorado ZR2’s lack of creature comforts and interior refinement — and brute strength. A Raptor, the Colorado ZR2 is not. · It’s the Colorado that’s most oriented to the off-road lifestyle. · As comfortable on the rocks as on the road (seriously). · Features segment-first dampers that flatten most trail imperfections. · Powered by turbodiesel torque or a naturally aspirated V-6. · 8.9 inches of ground clearance.